Relief cheque distributions to those affected by last week’s devastating floods continued yesterday in Sangre Grande, Greenvale Park, La Horquetta and Mafeking, Mayaro but while residents are grateful for the assistance, they felt the method could be better. Hundreds of people showed up to the Ministry of Social Development and Family Services' distribution centre in the Housing Development Corporation (HDC) tent at Greenvale in weather markedly different from the last Saturday’s deluge. They stood in the sun waiting to hear their names, while officials yelled names off a list in no particular order. The set-up was ad hoc. Representatives of the ministry and the HDC, who declined to speak with Sunday Newsday, were seated under tents, armed with a list of beneficiaries, but no system to easily sort people for efficiency of distribution. Once again, the community spirit of co-operation came to the fore as, when one name was called, the rest of the crowd echoed it, in hopes of finding that person. A number of people who were previously unaware of the option to receive grants had shown up as well, something for which the ministry was apparently unprepared, so resources had to be redistributed to take those requests as well. Despite the frustrations, spirits were high, as people, resigned to the situation—and still in the process of cleaning up— were eager to move on with their lives. One good Samaritan, who preferred not to give her name, stopped to drop off some food and drinks for those who had been waiting, some for over four hours. “We have family living here and seeing their losses, we know what these people went through, so if we can offer assistance in any way, we just thought we would come down and give them some support,” she said. Cheque distribution in Greenvale was scheduled to begin at noon, but people had been lining up since 8 am, Sunday Newsday was told. Greenvale was among the worst hit areas during the floods, with water reaching up to ten feet in some parts. People had to be evacuated by boat, some having spent the night on their roofs to escape rising water. The cheques are government grants intended to help affected residents replace lost household items, including appliances, that were destroyed by floodwaters. Government has allocated an emergency $25 million to assist with the relief efforts, as well as accepted $4 million in contributions from international organisations. Millions of dollars more of aid has been pouring in from the diaspora, but primarily from individuals and the local private sector. Social Development Minister Cherrie-Ann Cockburn-Crichlow did not respond to Sunday Newsday's calls attempting to ascertain the total cost of claims so far. Cheque distribution began on Friday at the Arima Velodrome for residents of Greenvale, as well as at the Las Lomas Primary School for flood victims of Kelly Village and St Helena. 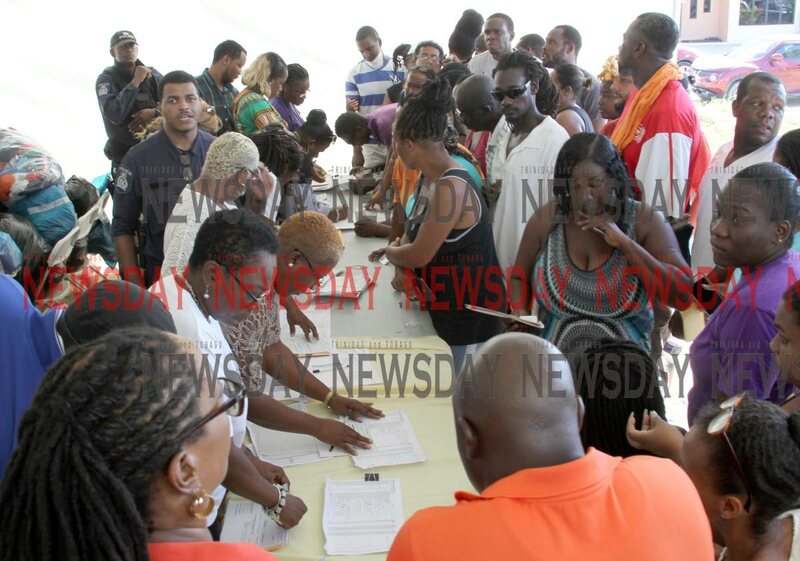 A distribution also took place at TTPost head office, Piarco, for Oropune residents. Assessments are continuing in several areas over the weekend and into next week and cheques will continue to be distributed until all claims are satisfied.